Unfortunately I’ve not had chance to read this book but a quick scan through suggests it will be an enjoyable one. 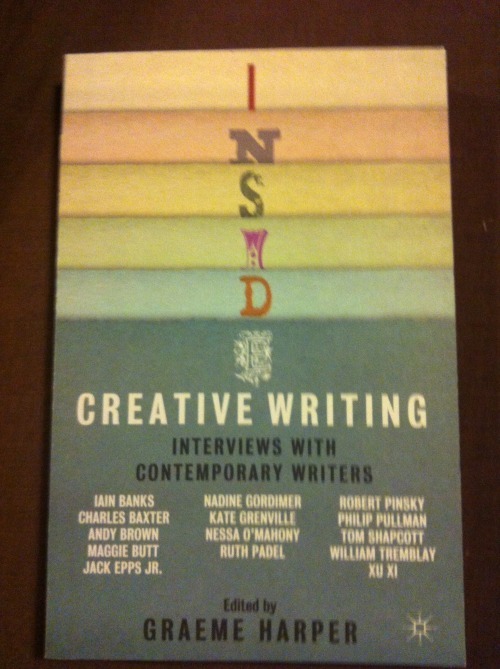 Like my last post it is a book where writers ‘talk’ about writing. When I first got it and had a look I did think that the project that Graeme Harper had undertaken is similar to what I want to do for my PhD so the first thought was panic because PhDs are all about originality. Mine will have the added occupational science slant and I’m sure/I hope I will be taking a slightly different focus. He basically asked fifteen questions of fourteen contemporary writers including Iain Banks, Nadine Gordimer and Philip Pullman. Graeme writes an overall introduction and conclusion and there is an introduction to each chapter, the responses of the writers interviewed and each concludes with an exercise and reflection point. Like the last book this has an academic slant but it seems very accessible. I think this will be a very useful and necessary text for me to read cover to cover – it’s on the very long list. Who would be your top writers to interview? Posted on April 8, 2013, in April A-Z Challenge, Book Reviews, OT/Lecturing/PhD Reviews, PhD and tagged A-Z 2013, Graeme Harper, Interviews with Contemporary Writers. Bookmark the permalink. 2 Comments. This really sounds like a worthwhile read. I’m putting it on my TBR list. Thanks!